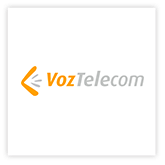 VozTelecom is a communications operator 100% specialized in the business segment. The company, which has been listed on the alternative stock market since July 2016 (VOZ: SM), offers a complete and innovative portfolio of communications services under the OIGAA brand name. Founded in 2003 and based in the Vallés Technology Park (Barcelona), it offers its services through an extensive distribution network with a presence throughout Spain. With the aim of becoming the main operator for companies in Spain, the company is in the process of expansion in which it is committed to opening new Service Points and expanding its distribution network in the main provinces. The company currently has a team of more than 150 professionals, who serve more than 40,000 users of OIGAA services, with their own support and customer service team. VozTelecom since its inception has made a significant effort in development and R&D, recognized by numerous international awards, while at the same time it has obtained the seal of Pyme Innovadora awarded by the Ministry of Economy and Competitiveness.